Mobile elements have shown the advantages in wireless sensor networks not only in data collection and transmission but also in the field of region coverage. The mobile sensor nodes (MSNs) whose mobility is controlled, visits the predetermined locations and collects the environmental information as per the procedure called MSNs traversal algorithms. The major performance bottleneck in MSNs is the energy source which is impractical to replace after the deployment. In random deployment, single or a group of MSNs may fall at the same location or at different locations, whose starting positions of traversal and traversal paths may differ from the preplanned. This work formulates the problem of scheduling the MSNs in distributed manner so that the entire region is covered without coverage holes with minimum energy depletion. Finally, some computationally practical algorithms for multiple MSNs with fault and non-fault tolerant support are presented and their performances compared. D’Souza, R. J., & Santoshi, G. (2012). Optimal 2-coverage by heterogeneous mobile sensor nodes using triangular scheme. In Elsevier procedia technology, 2nd international conference on computer, communication, control and information technology (C3IT-2012) on February 25–26 (vol. 4, pp. 187–195). https://doi.org/10.1016/j.protcy.2012.05.028. http://www.sciencedirect.com/science/article/pii/S2212. D’Souza, R. J., & Santoshi, G. (2014). Dynamic coverage by hemegeneous mobile sensor nodes using tri-hexagonal scheme. In Emerging research in electronics, computer science and technology. Springer lecture notes in electrical engineering. https://doi.org/10.1007/978-81-322-1157-0-93. Fu, X., Xu, Z., Peng, Q., You, J., Fu, L., Wang, X., & Lu, S. (2017). 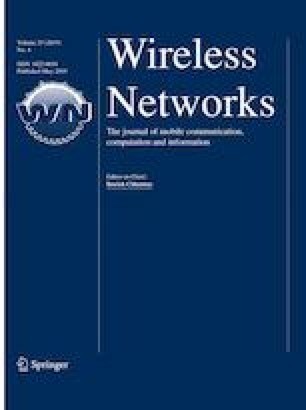 Conmap: A novel framework for optimizing multicast energy in delay-constrained mobile wireless networks. In Proceedings of the 18th ACM international symposium on mobile Ad hoc networking and computing, Mobihoc ’17 (pp. 2:1–2:10). New York, NY: ACM. https://doi.org/10.1145/3084041.3084047. Mikhaylov, K., & Tervonen, J. (2013). Energy Consumption of the mobile wireless sensor network’s node with controlled mobility. In Advanced information networking and applications workshops (WAINA), 2013 27th international conference (pp. 1582–1587). https://doi.org/10.1109/WAINA.2013.86. Sun, Z., & Reif, J. (2003). On energy-minimizing paths on terrains for a mobile robot. In Robotics and automation, proceedings of IEEE international conference, ICRA ’03 (vol. 3, pp. 3782–3788). https://doi.org/10.1109/ROBOT.2003.1242177.